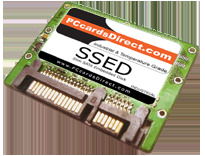 PCcardsDirect slim SATA Industrial Temperature rated at -40°C ~+85°C to fulfill various specialized embedded applications in harsh operating environments. Slim SATA embedded drives is the ideal format when high capacity and high realiability are criticle. Available in capacities ranging from 1GB up to 16GB temperature rated and 256GB standard temperature rated.